KIBERA SLUM – AUGUST 5: A 44-year-old Kenyan woman who lives in Kibera has been performing unsafe abortions since 1986. She learned how to induce labor using a knitting needle and a rubber straw from a midwife in Machakos. She preformed her first illegal abortion on the midwife who had originally taught her the method. The midwife was 6 months pregnant and the abortion was procured while her husband was out of town. The 44-year-old abortionist has had 3 abortions herself and has preformed them for her daughters as well. Her 26-year-old daughter has had 2 and her 18-year-old daughter has had 2 as well, the first being at age 12. She charges up to 1,000 Kenya shillings for the procedure, but also performs it for free for women who don't have enough money. She estimates that she performs between 1 and 3 unsafe, illegal abortion per month, December being her busiest month. "It should be legally permitted, it must be accepted in the country otherwise many women will die because they are too poor." 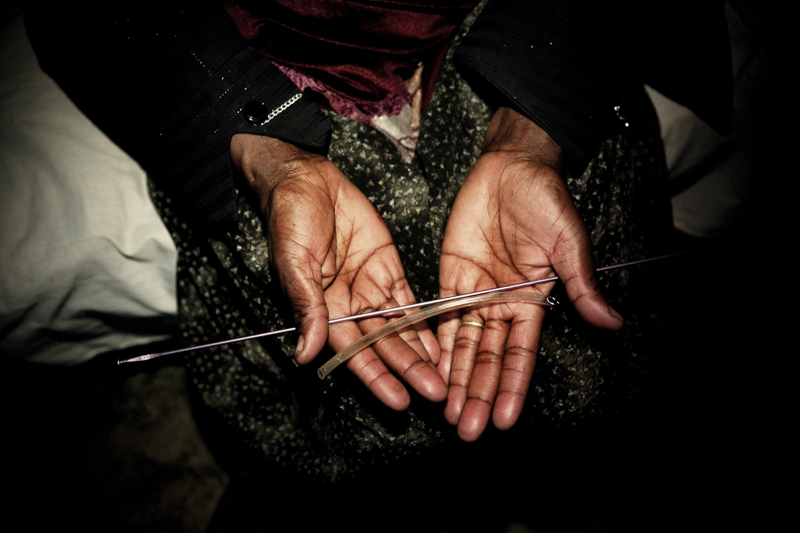 The abortionist holds a knitting needle and a rubber straw in her hands, the tools she uses to perform unsafe abortions in the slum of Kibera in Nairobi, Kenya on August 5th, 2010.